it was a big gamble bringing this collection into boston … not because the design it too outrageous, mostly because of the price tags. which are high. but the collection is selling, actually selling better then balmain did this time last year! This dress is around 6,000, and i sold it earlier today! This is hands down my favorite look which is still available… the combo will cost around 10,000. 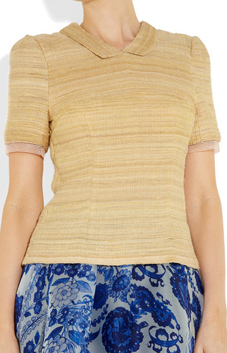 I have one of these wheat tops left, we had it in mauve lace also, which is sold out.